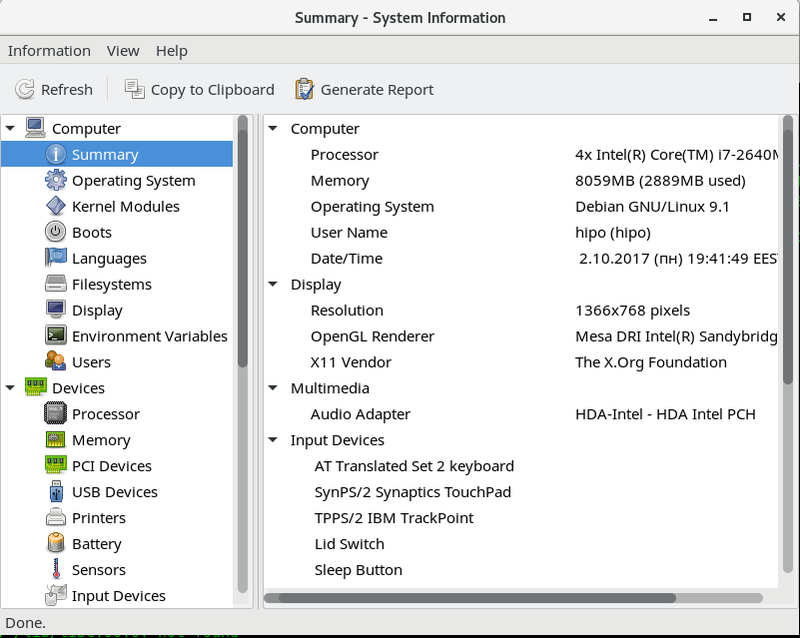 IS THERE A GRAPHIC ( GUI ) TOOL TO VIEW HARDWARE INFORMATION ON LINUX? If you are a console maniac like myself, perhaps you never think that you might need anything graphical besides to view hardware information on Linux, but as we're growing older sometimes it becomes much less easier to just use a graphical tool that can show us all the information we need regarding a Notebook / Desktop PC with Linux or even Server machine with enabled Graphical Environment with a brand new installed GNU / Linux whatever version (I hope you don't own server with running Xorg / Gnome / Mate / Xfce etc. as that's pretty much a waste of hardware resource and opens a dozen of other security risks for the server running services ). 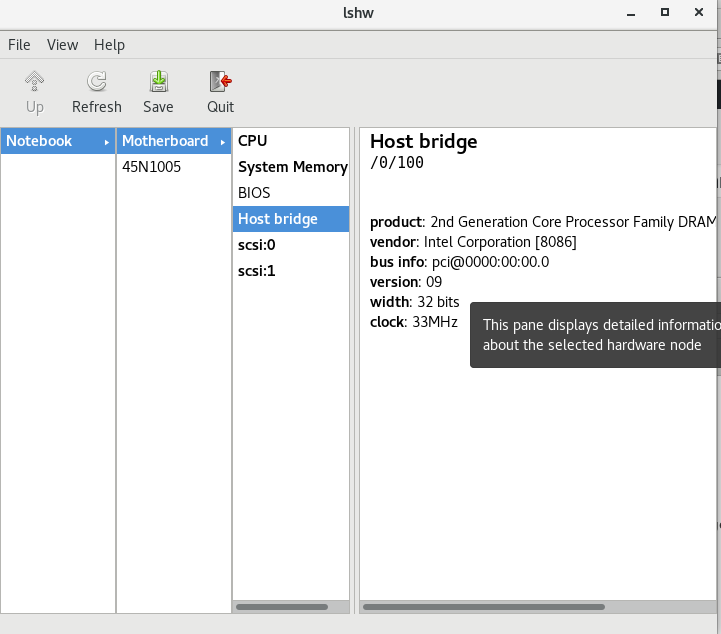 HardInfo – is a small application that displays information about your hardware and operating system. Currently it knows about PCI, ISA PnP, USB, IDE, SCSI, Serial and parallel port devices. True that the tests, are pretty simple but still could be useful. 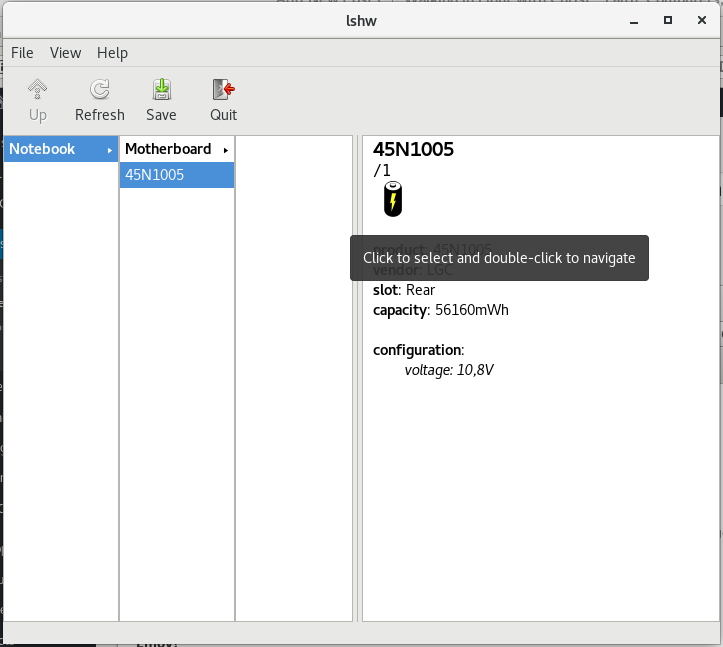 Here is few more screenshots from hardware info reported from my ThinkPad T410 Laptop Running Debian 9 Stretch at the moment. The great thing about generating HTML report for hardware is that on Staging / Production / Development servers which you inherited from some other administrator who for some reason (laziness 🙂 ) didn't left necessery documentation, you can easily map the machine hardware and even if it is a group of machines, you can automate report generation for all of them write a short script that parses the data on each of the HTML reports and finally creates a merged document with main important information about hardware of a cluster of computers etc. WARNING: you should run this program as super-user. WARNING: output may be incomplete or inaccurate, you should run this program as super-user. If you're Windows user like me with a Linux / FreeBSD / OpenBSD / NetBSD – a dedicated Unix user and end up working for financial reasons in some TOP 100 Fortune companies (CSC, SAP, IBM, Hewlett Packard,Enterprise, Oracle) etc. and forced for business purposes (cause some programs such as Skype for Business Desktop Share does not run fine on Unix like and thus you have to work notebook pre-installed with Windows 7 / 8 or 10 but you're so accustomed to customizations already from UNIX environments and you would like to create yourself the Windows to resemble Linux and probably customize much of how Windows behaves by default. Here is what I personally did on my work Windows 7 Enterprise on my HP Elitebook notebook to give myself the extra things I'm used to my Debian Linux Desktop. 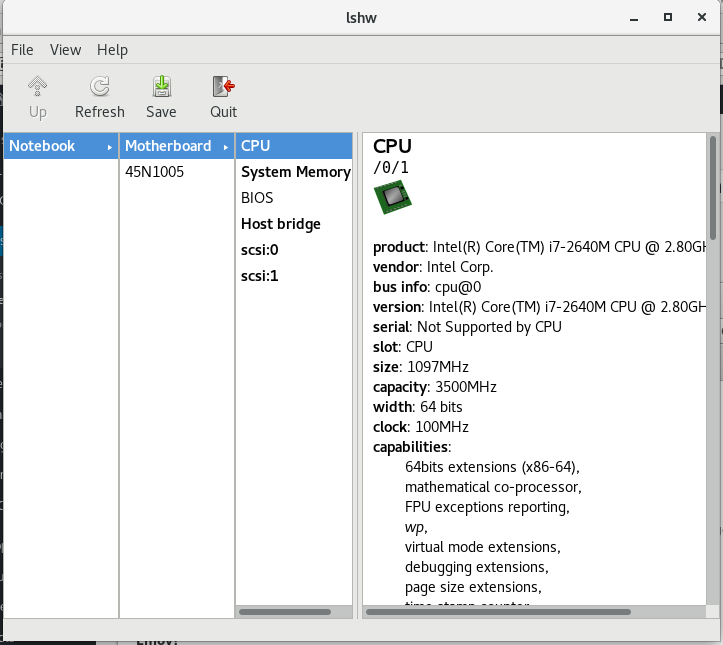 CygWin, (to provide Windows with most needed console Linux tools), Clink. Along with all above goodies here is also some good software I find essential for every web developer / system administrator / network administrator or java, C, php pprogrammer out there that's using Windows as his Desktop platrofm. 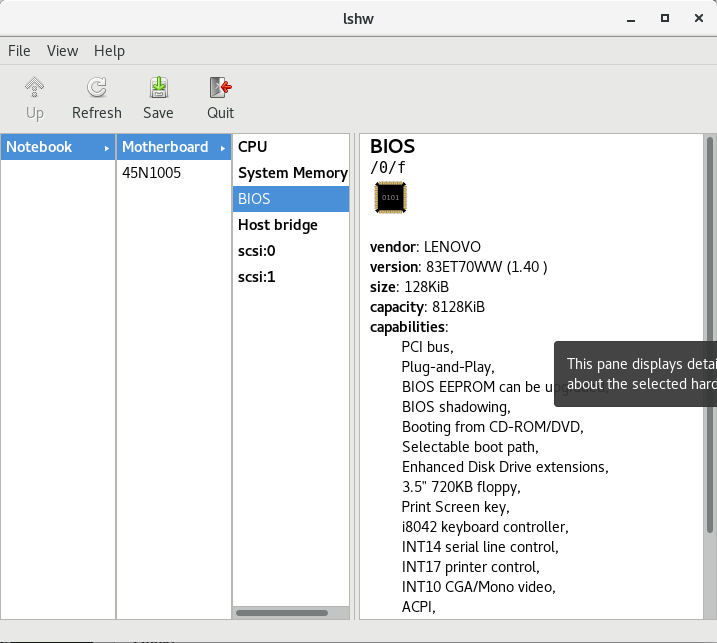 Perhaps there is plenty of other goodprograms to install on Windows to make it feel even more like a Linux / Unix Desktop host, if you happen to somehow stuck to this article and you've migrated from Llinux / BSD desktop to Windows for work purposes please share with me any other goodies you happen to use that is from *Unix. Last Sunday 08.05.2016, we travelled with my beloved friend Elica on Opel Astra car (The so called Police Opel as this opel is well known in Bulgaria because it is the most used car by Police forces in Bulgaria. 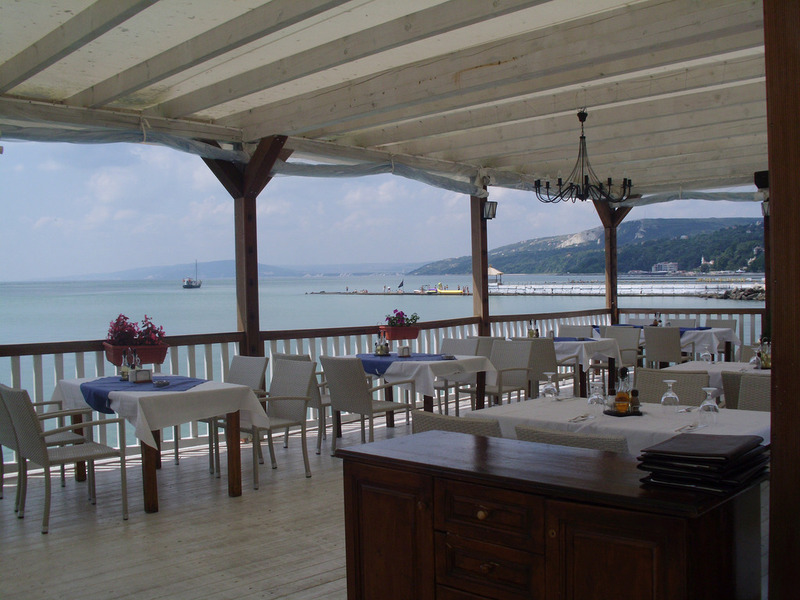 The distance from Dobrich to Balchik Sea Town is very near (by car its only 31.5 km). Nearby Balchik situated in 20-30 km, there are plenty of other uniquely beatiful Sea resorts, just to name a few Albena, Kranevo, Golden Sands, Kavarna. From Balchik Seacoast it is visible Albena's remote shore, which is one of favourite tourist destination for Russian and one of the most famous tourist resort in Bulgaria are visible. 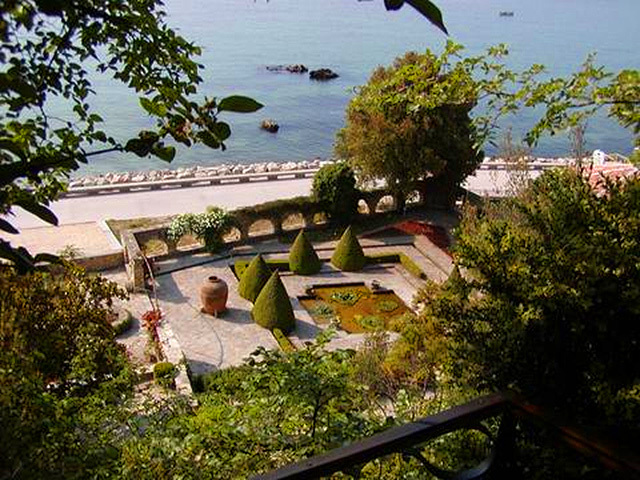 What makes Balchik a great place to visit is also its unique and rich history, the city was inhibited more than 2500+ years ago, according to Herodotus in 585 – 550 year B.C. Balchik's history is very dramaticit was of the important sea cities to control by Thracians (during Thracian Empire) later by Romans, conseqnently by Greeks in Byzantine times and since the creation of Bulgaria in year 681 by Bulgarians (during first and second Bulgarian Kingdom) and under Turkish Slavery 1396-1878 by Turks (during Ottoman Turkish Empire), then after the liberation again by Bulgarians, during the Balkan wars controlled by Romanians as part of Romania and finally since September 7 1940 after the restoration of Southern Dobrudzha region to Bulgaria again part of Re-United Bulgaria. 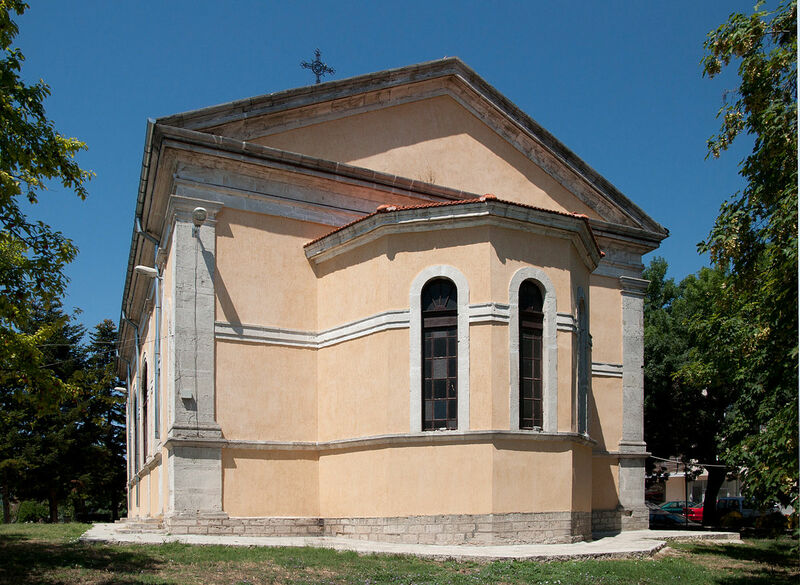 Once reaching Balchik, we attended Sunday Holy Liturgy in the Saint George majestic Church which on a first looks by its size gives the observer the impression of a small Eastern Cathedral Cathedral. On this date it was the Sunday of the Doubting Thomas the last day of the so called Bright week (the first week after Eastern Orthodox Pascha). The service was amazingly beautiful with ac choire of only few ladies headed for my surprise by a non-Bulgarian (Belarusian) chorister lady Svetlana. The serving priest Father Stratia is a really tall and ascetic looking priest by the way he served the service and he prayed it was evident he possess a deep faith in God and perhaps a true heart relationship with Christ. The Church is full of icons and has a very unique iconostatis which by the words of the priest is the most unique Church iconostasis made by a Russian person and is the most unique and beatiful Church craftwork in the whole Dobrich region. The Russian influence in the Church is also evident by the many icons of well known Russian saints such as Saint John of Kronstadt, Saint Seraphim Seravski, Saint Xenia from Peterburg, Saint Matriona from Moscow, Saint King Vladimir etc. etc. Also it is very remembering experience in this Church the high number of different icons of saint George, many of which are well known and miracle making from Mount Athos (Fanailova) icon etc. After the end of the Church service we had a walk through a piece of old stone strairs which are common for Balchik. At the end of the service he blessed and wished a lot of "brightness and love" for the coming week and we went down from Balchik city center through a beautiful old stone stairs leading down to the Seacoast and Balchik's beach. We spend some time on the coffee waiting for Mitko and Samuil to drop by because we had agreed the previous day to travel by Mitko's Citroen C3 Pluriel (tutle sized car) from Balchik to Sofia. Nearby the sea coast as in most of resorts there is a line with caffeterias and restaurands with a nice view facing the sea and a remote tiny mountain hights. 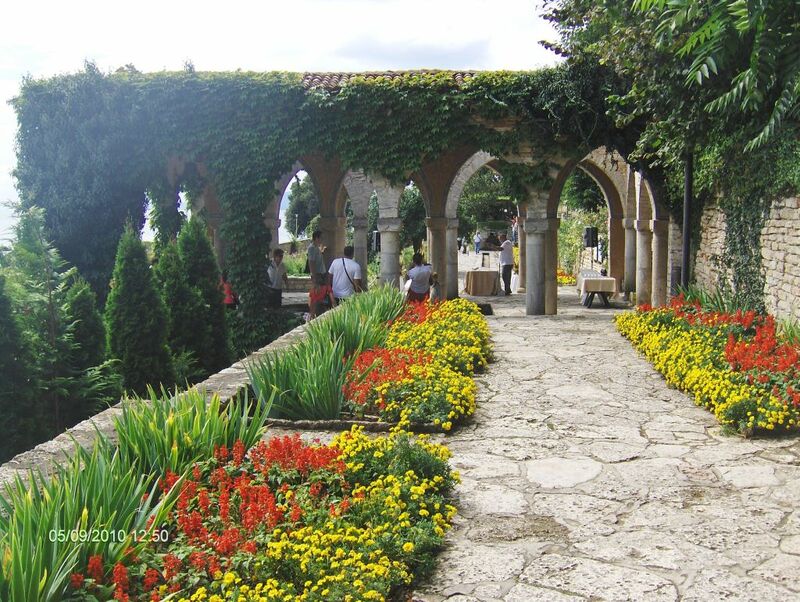 Balchik and the region is one of the most beautiful and green locations all around Dobrudja region with a beatiful plants, trees, herbs, woods. 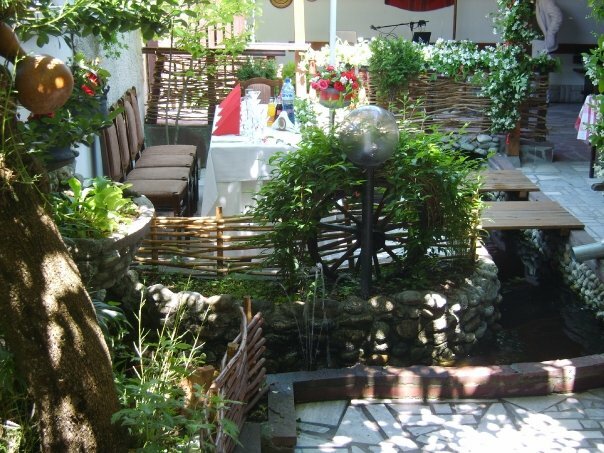 There are also few springs mineral drinable water in and nearby Balchik and the town is also famous for the healing mud center and many thermal springs of Tuzlata. The temperature of the health water is 33 degrees centigrade; it is without color, low mineralized, and has excellent gustatory properties. 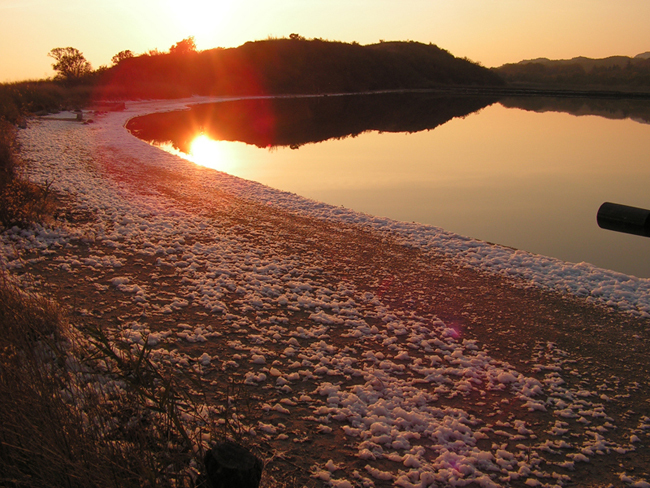 The curative mud which comes from two firth lakes is dark brown, coarse-grained and has perfect physic-chemical properties. Near to the lakes there is a balneological center. Using the healing properties of the mug, good results have been reported on the treatment of gynecological, nervous diseases, diseases of the locomotory system and so on. 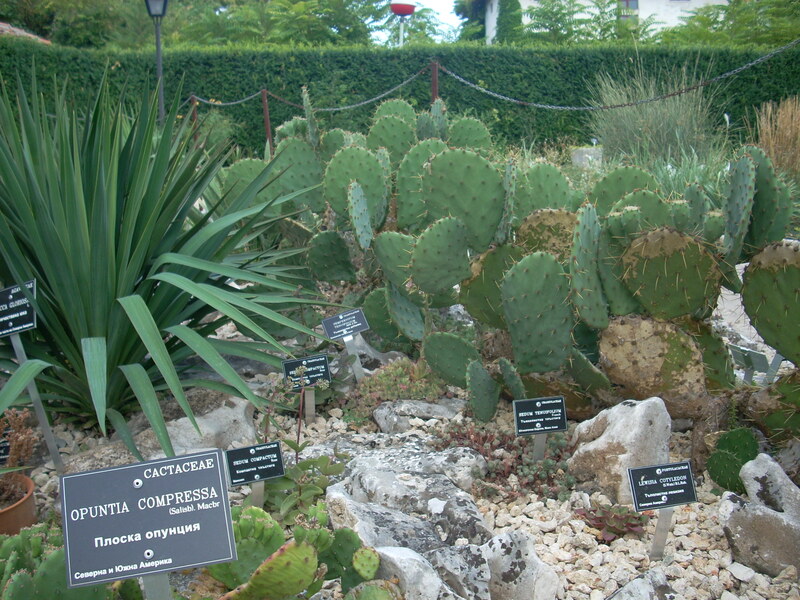 Balchik Tuzlata healing mud for recovering from and healing all kind of neurological, psycho-emotional and other diseases. 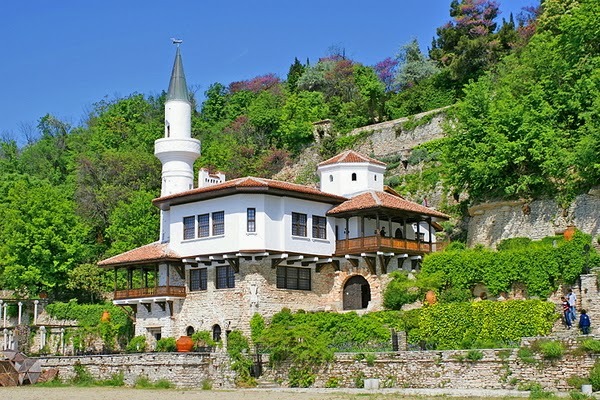 Perhaps the most famous and worthy thing to see in Balchik is Baclhik Palace (Dvoretz Balchik) which was constructed during 1926 – 1937 for the rest needs of the Romanian Queen during romanian control of the region in communist years of Bulgaria (1945 – 1989) and onwards it was reorganized to become one of the major and biggest Botanical garden in Bulgaria and is famous as Balchiks Botanical Garden exposing the largest collection of large cactuses in Bulgaria arranged in 1000 m2, the second biggest collection of Cactuses following after the one in Monaco. 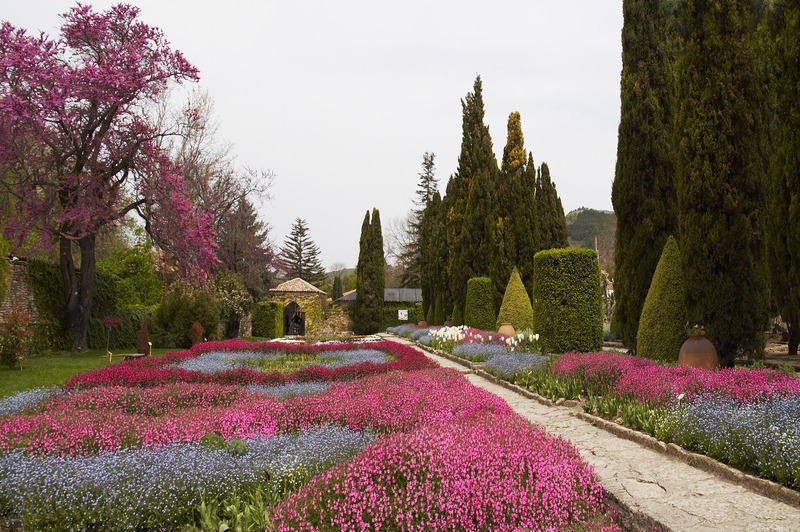 The garden is absolutely unique to see mixing together architectural characteristics for Balkans and oriental motifs such as from Islam the garden was build by Italian architects Augustino and Americo and the overall arrangement of the Palace was made by a Swiss frorist. The main Palace building's extravagant minaret coexists with a Christian chapel, perfectly illustrating the queen's Bahá'í beliefs. 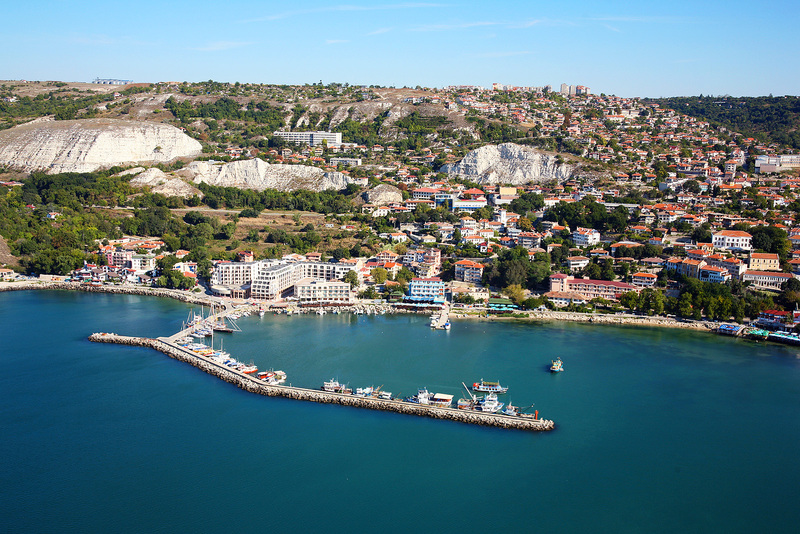 Though Balchik is only about 10000 to 12000 of citizens it is the second largest town in Dobrich region, rich for historical reason in diverse culture and architecture. Below is a small chunk of the many interesting old historical things the lover of beauty can enjoy. Though it is a little in size it has obsiouly rich citizen spirituality as the city has 5 Churches 4 of which in active service. 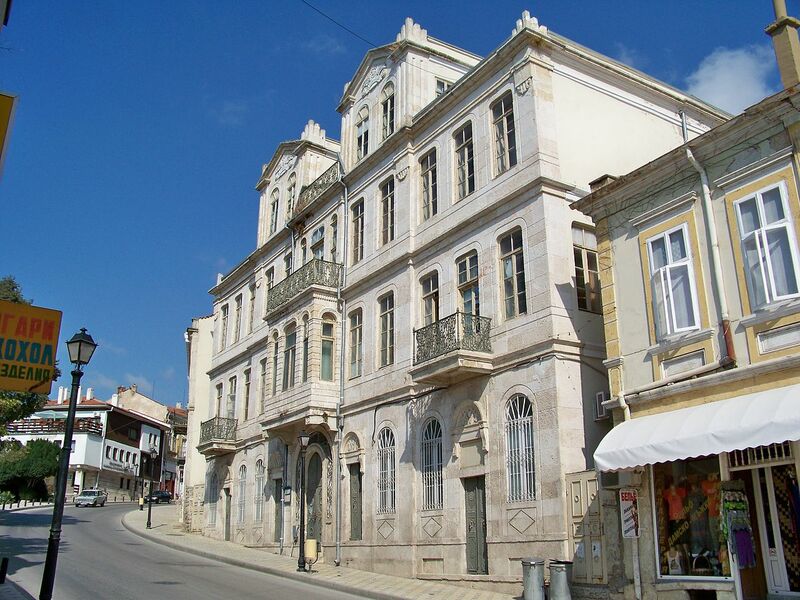 Balchik is situated on a steep hills thus, the roads are а bit uneven like in mountains, one can see in city center also some builtiful 'bulgarian renesanse' buildings left from 19th century architecture in the famous for that time Austrian / Italian Architecture. As Balchik is small in size it is perfect for people who want to have rest in a cozy town and still have all conveniences of a beach resort. 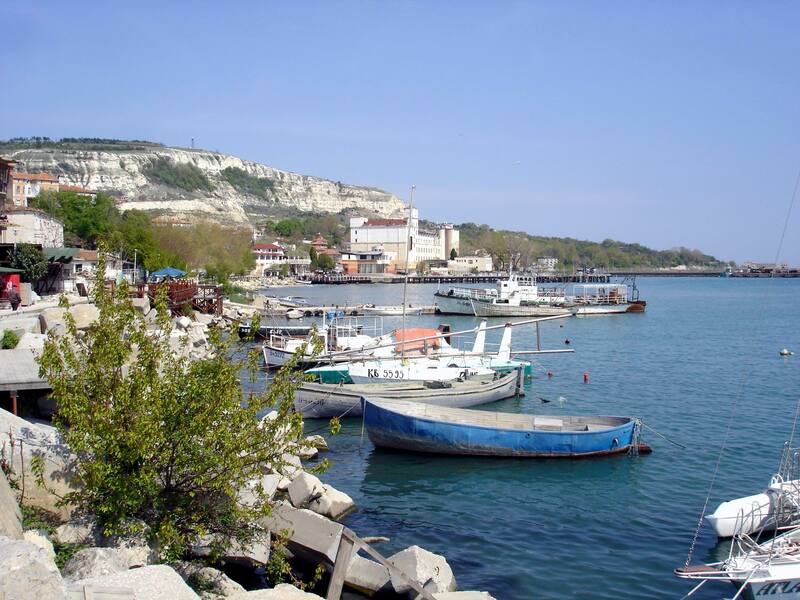 The overall feeling of being in Balchik is like in a small Italian sea town with the only difference that the prices of food and drinks in Balchik are quite affordable if compared to Western Europe resorts. A four people meal with some small drinks nearby see would be cheap like 40-50 euro. 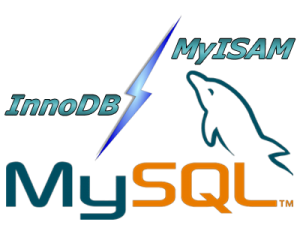 If you're a webhosting company hosting dozens of various websites that use MySQL with InnoDB engine as a backend you've probably already experienced the annoying problem of MySQL's ibdata1 growing too large / eating all server's disk space and triggering disk space low alerts. The ibdata1 file, taking up hundreds of gigabytes is likely to be encountered on virtually all Linux distributions which run default MySQL server <= MySQL 5.6 (with default distro shipped my.cnf). 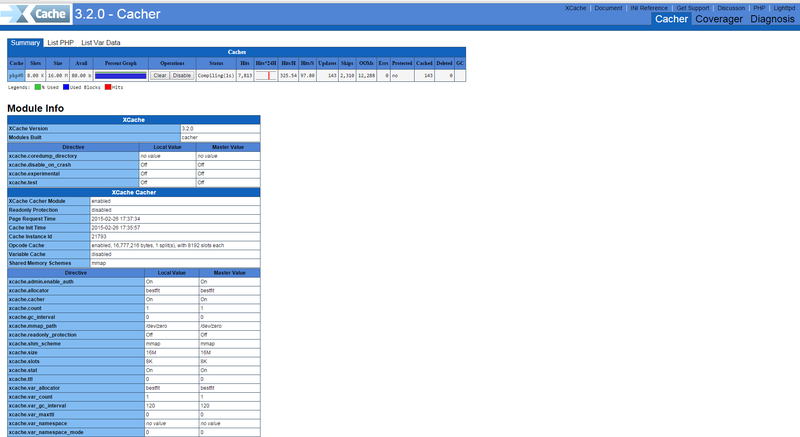 The excremental ibdata1 raise appears usually due to a application software bug on how it queries the database. In theory there are no limitation for ibdata1 except maximum file size limitation set for the filesystem (and there is no limitation option set in my.cnf) meaning it is quite possible that under certain conditions ibdata1 grow over time can happily fill up your server LVM (Storage) drive partitions. Unfortunately there is no way to shrink the ibdata1 file and only known work around (I found) is to set innodb_file_per_table option in my.cnf to force the MySQL server create separate *.ibd files under datadir (my.cnf variable) for each freshly created InnoDB table. Below cmd should return empty output, (e.g. 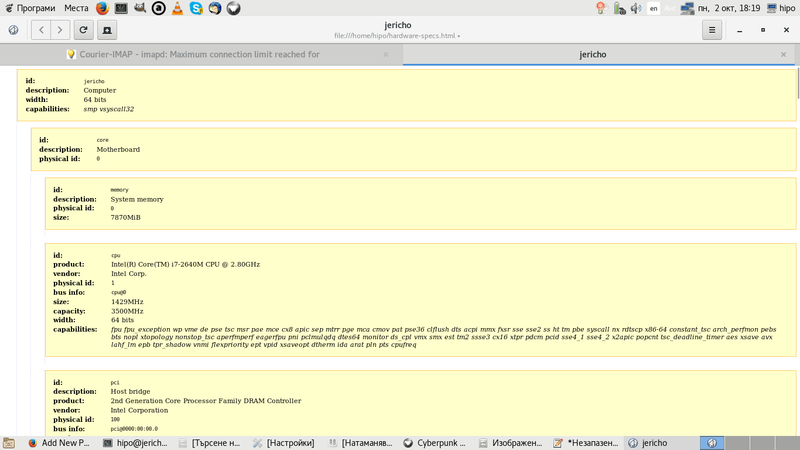 Apache / Nginx / Postfix / Radius / Dovecot / DNS etc. services are properly stopped on server). If you have free space on an external backup server or remotely mounted attached (NFS or SAN Storage) it is a good idea to make a full binary copy of MySQL data (just in case something wents wrong with above binary dump), copy respective directory depending on the Linux distro and install location of SQL binary files set (in my.cnf). You should get no running MySQL instance (processes), so above ps command should return blank. Hopefully import should went fine, and if no errors experienced new data should be in. Now ibdata1 will grow, but only contain table metadata. Each InnoDB table will exist outside of ibdata1. To better understand what I mean, lets say you have InnoDB table named blogdb.mytable. Now construction will be like that for each of MySQL stored databases instead of everything to go to ibdata1. MySQL 5.6+ admins could relax as innodb_file_per_table is enabled by default in newer SQL releases. Now to make sure your websites are working take few of the hosted websites URLs that use any of the imported databases and just browse. In my case ibdata1 was 45GB after clearing it up I managed to save 43 GB of disk space!!! As a WordPress blog owner and an sys admin that has to deal with servers running a lot of WordPress / Joomla / Droopal and other custom CMS installed on servers, performoing slow or big enough to put a significant load on servers and I love efficiency and hardware cost saving is essential for my daily job, I'm constantly trying to find new ways to optimize Customer Website (WordPress) and rest of sites in order to utilize better our servers and improve our clients sites speed (and hence satisfaction). There is plenty of little things to do on servers but probably among the most crucial ones which we use nowadays that save us a lot of money is tmpfs, and earlier (ramfs) – previously known as shmfs). TMPFS is a (Temporary File Storage Facility) Linux kernel technology based on ramfs (used by Linux kernel initrd / initramfs on boot time in order to load and store the Linux kernel in memory, before system hard disk partition file systems are mounted) which is heavily used by virtually all modern popular Linux distributions. 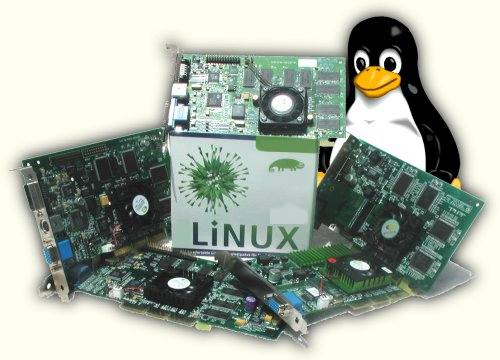 Using ramfs (cramfs variation – Compressed ROM filesystem) has been used to store different system environment kernel and Desktop components of many Linux environment / applications and used by a lot of the Linux BootCD such as the most famous (Klaus Knopper's) KNOPPIX LiveCD and Trinity Rescue Kit Linux (TRK uses /dev/shm which btw can be seen on most modern Linux distros and is actually just another mounted tmpfs). If you haven't tried Live Linux yet try it out as me and a lot of sysadmins out there use some kind of LiveLinux at least few times on yearly basis to Recover Unbootable Linux servers after some applied remote Updates as well as for Rescuing (Save) Data from Linux server failing to properly boot because of hard disk (bad blocks) failures. As I said earlier TMPFS is also used on almost any distribution for the /dev/ filesystem which is kept in memory. The /run tmpfs mounted directory is also to be seen also on latest Ubuntus and Fedoras and is actually the good old /var/run ( where applications keep there pids and some small app related files) stored in tmpfs filesystem stored in memory. 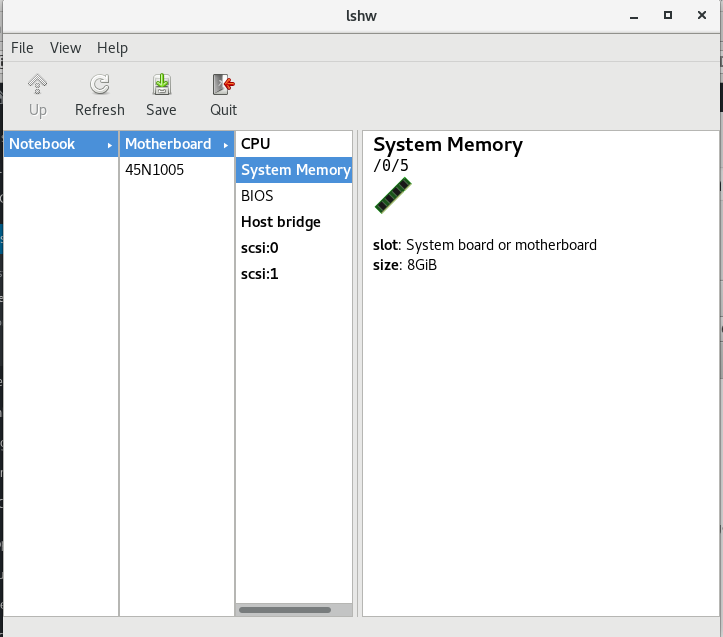 If you're wondering what is /dev/shm and why it appears mounted on every single Linux Server / Desktop you've ever used this is a special filesystem shared memory which various running programs (processes) can use to transfer data quick and efficient between each other to preven the slow disk swapping. People using Linux for the rest 15 years should remember /dev/shm has been a target of a lot of kernel exploits as historically it had a lot of security issues. While writting this article I've just checked about KNOPPIX developed amd just for info as of time of writting this distro has already 1000+ programs on CD version and 2600+ packages / application on DVD version. Nowadays Knoppix is mostly used mostly as USB Live Flash drive as a lot of people are dropping CD / DVD use (many servers doesn't have a CD / DVD Drive) and for USB Live Flash Linux distros tmpfs is also key technology used as this gives the end user an amazing fast experience (Desktop applications run much fasten on Live USBs when tmpfs is used than when the slow 7200 RPM HDDs are used). Loading big parts of the distribution within RAM (with tmpfs from Linux Kernel 2.4+ onwards) is also heavily used by a lot of Cluster vendors in most of Clustered (Cloud) Linux based environemnts, cause TMPFS gives often speeds up improvements to x30 times and decreases greatly I/O HDD. FreeBSD users will be happy to know that TMPFS is already ported and could be used on from FreeBSD 7.0+ onward. and Hyper Cache / WP Super Cache disk caching and MySQL server as a Database backend. Below example is wordpress specific but since it can be easily applied to Joomla, Drupal or any other CMS out there that uses mySQL server to make a lot of CPU expensive memory hungry (LEFT JOIN) queries which end up using a slow 7200 RPM hard disk. The great thing about TMPFS is it never uses all of the available RAM and SWAP, which would not halt your server if TMPFS partition gets filled, but instead you will start getting the usual "Insufficient Disk Space", just like with a physical HDD parititon. RAMFS cares much less about server compared to TMPFS, because if RAMFS is historically older. ramfs file systems cannot be limited in size like a disk base file system which is limited by it’s capacity, thus ramfs will continue using memory storage until the system runs out of RAM and likely crashes or becomes unresponsive. This is a problem if the application writing to the file system cannot be limited in total size, so in my opinion you better stay away from RAMFS except you have a good idea what you're doing. Another disadvantage of RAMFS compared to TMPFS is you cannot see the size of the file system in df and it can only be estimated by looking at the cached entry in free. Note that before proceeding to use TMPFS or RAMFS you should know besides having advantages, there are certain serious disadvantage that if the server using tmpfs (in RAM) to store files crashes the customer might loose his data, therefore using RAM filesystems on Production servers is best to be used just for caching folders which are regularly synchronized with (rsync) to some folder to assure no data will be lost on server reboot or crash. Memory of fast storage areas are ideally suited for applications which need repetitively small data areas for caching or using as temporary space such as Jira (Issue and Proejct Tracking Software) Indexing As the data is lost when the machine reboots the tmpfs stored data must not be data of high importance as even scheduling backups cannot guarantee that all the data will be replicated in the even of a system crash. debian-server:~# mount |grep -i -E "ramfs|tmpfs"
To illustrate better a tmpfs use case on my blog running WordPress with W3TotalCache (W3TC) plugin cache folder in /var/www/blog/wp-content/w3tc to get advantage of tmpfs to store w3tc files. Or if you're on a CentOS / RHEL server use httpd Apache user instead and whenever you have docroot and wordpress installed. If you're using Apache SuPHP use whatever the UID / GID is proper. As I said earlier the biggest problem with caching (the reason why many hosting providers) and site admins refuse to use it is they might loose some data, to prevent data loss or at least mitigate the data loss to few minutes intervals it is a good idea to synchronize tmpfs kept folders somewhere to disk with rsync. Its common that MySQL servers had to serve a lot of long and heavy SQL JOIN Queries mostly by related posts WP plugins such as (Zemanta Related Posts) and Contextual Related posts though MySQLs are well optimized to work as much as efficient using mysql tuner (tuning primer) still often SQL servers get a lot of temp tables created to disk (about 25% to 30%) of all SQL queries use somehow HDD to serve queries and as this is very slow and there is file lock created the overall MySQL performance becomes sluggish at times to fix (resolve) that without playing with SQL code to optimize the slow queries the best way I found is by using TMPFS as MySQL temp folder. Now monitor your server and check your pagespeed increase for me such an optimization usually improves site performance so site becomes +50% faster, to see the difference you can test your website before applying tmpfs caching for site and after that by using Google PageInsight (PageSpeed) Online Test. Though this example is for MySQL and WordPress you can easily adopt the same for Joomla if you have Joomla Caching enabled to some folder, same goes for any other CMS such as Drupal that can take use of Disk Caching. Actually its a small secret of many Hosting providers that allow clients to create sites via CPanel and Kloxo this tmpfs optimizations are already used for sites and by this the provider is able to offer better website service on lower prices. VPS hosting providers also use heavy caching. 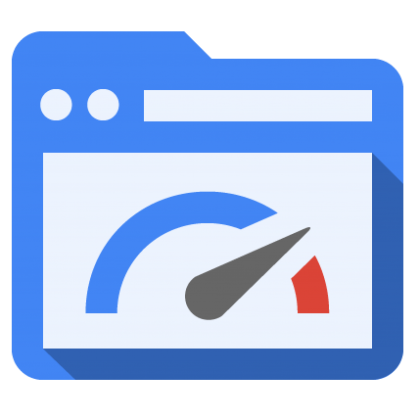 A lot of people are using TMPFS also to accelerate Sites that have enabled Google Pagespeed as Cacher and accelerator, as PageSpeed module puts a heavy HDD I/O load that can easily stone the server. Many admins also choose to use TMPFS for /tmp, /var/run, and /var/lock directories as this leads often to significant overall server services operations improvement. Once you have tmpfs enabled, It is a good idea to periodically monitor your SWAP used space with (df -h), because if you allocate bigger tmpfs partitions than your physical memory and tmpfs's full size starts to be used your machine will start swapping heavily and this could have a very negative performance affect. The applications of tmpfs to accelerate services is up to your imagination, so I will be glad to hear from other admins on any interesting other application or problems faced while using TMPFS. I was using Eaccelerator until recently on all Apache / PHP / MySQL (LAMP) web-servers as a caching engine (Webserver accelerator) across all Debian GNU / Linux Lenny / Squeeze / Etch servers. Our servers are quite busy serving about 50 000 to 100 000 requests and thus not having enabled caching puts a lot of extra load on the CPU and eats a lot of memory which were usually saved by eAccelerator. Logically I tried fixing the issues following some Stackoverflow threads recommendations such as this one but didn't work I tried playing manually spending hours trying to make eaccelerator run again and as a final mean, I even tried to upgrade eaccelerator to newer version but noticed the latest available eaccelerator version 0.9.6 was 2.5 years old (from 03.09.2012). Thus while there is no new release, just make s so just to make sure I didn't break the module with (default Debian bundled distribution package which is also installed on the servers) re-installed eAccelerator from source . This didn't worked either and since I was totally pissed off by the worsened systems performance (CPU load increased with to 10-30%) per server, I looked for some alternatives I can use and in the mean time I learned a bit more about history of PHP Accelerators, I learned some interesting things such as that ionCube (PHPA) was the first PHP Accelerator Apache like module (encoding PHP code), created in 2001, later it become inspirational for birth to PHP-APC (Alternative PHP Cache) Apache module. There is also Zend Opcache PHP accelerator (available since PHP 5.5 onwards) but since Zend OpCache caches well PHP Zend written PHP code and servers run PHP 5.4 + sites are not using Zend PHP Framewosk this was an option. Further investigation lead me to MMCache which is already too obsolete (latest release is from 2013), PHPExpress – PHP Encoder which was said to run on Windows, Linux, FreeBSD, NetBSD, Mac OS X, and Solaris) but already looks dead as there were no new releases since January 2012) and finally Lighttpd's XCache. Obviously my short research shows that from all the available PHP Cache Encoder / Accelerators only ones that seemed to be recently updated (under active development) are APC and XCache. I've already used PHP-APC earlier on some servers and was having having some random Apache Webservers crashes and weird empty pages with some PHP pages and besides that APC is known to give lower speed in PHP caching than Eaccelerator and XCache, leaving me with the only and logical choise to use XCACHE. XCache is a free, open source operation code cacher, it is designed to enhance the performance of PHP scripts execution on servers. It optimizes the performance by eliminating the compilation time of PHP code by caching the compiled version of code into the memory and this way the compiled version loads the PHP script directly from the memory. This will surety accelerate the page generation time by up to 5 times faster and also optimizes and increases many other aspects of php scripts and reduce website/server load. ;; install as zend extension (recommended), normally "$extension_dir/xcache.so"
Note that Debian location which instructs xcache to load in Apache as a module is xcache.ini – e.g. /usr/share/php5/xcache/xcache.ini, so instead of placing above configuration right into php.ini you might prefer to place it in xcache.ini (though I personally prefer php.ini) because it is easier for me to later control how PHP behaves from single location. If you have time you can play with the options and get some speed minor speed improvements. The overall increase in page opening XCache should give you is between 100% – 190% ! For hosting companies and even personal website speed performance becomes increasingly important factor that gives higher and higher weight on overall PageRank and is one of the key things for Successful Site Search Engine Optimization (positioning) in Search Engines of a not specially SEO friendly crafted website. Virtually all Google / Yahoo / Bing, Yahoo etc. Search Engines give better pagerank to websites which load faster and has little or no downtimes, for the reason a faster loading time of a website pages means better user experience and is indicator that the website is well maintained. Adding <head> if missing on pages etc.
. Therefore as I said in many of my previous LAMP Optimization articles page (opening) speed could make really Bad Users / Clients experience when the site grows too big or is badly optimized it gives degraded page speed times (often page loads 20 / 30 seconds waiting for the page to load!). Having Pages lagging on big information sites or EShos has both Ruining Company's Image on the market and quickly convinces the user to use another service from the already thosands available and thus drives out (potential) customers. As Programming code maintainance and improvement is usually very costly, companies that want to save money or can't afford it (because of the shrinking budgets dictacted by the global economic crisis), the best thing to do is to ask your sysadmin to Squeeze the Best out of the WebService and Servers without major (Backend Code) infrastructural changes. extra CMS modules such as lets say WordPress W3 Total Cache there is Google Develop Apache Webserver external module – PageSpeed. What does Apache Google PageSpeed actually does? /etc/cron.daily/mod-pagespeed – mod_pagespeed cron script for checking and installing latest updates. /etc/cron.daily/mod-pagespeed : mod_pagespeed cron script for checking and installing latest updates. /etc/httpd/conf.d/pagespeed.conf : The main configuration file for Apache. /usr/lib/httpd/modules/mod_pagespeed.so : mod_pagespeed module for Apache. /var/www/mod_pagespeed/cache : File caching direcotry for web sites. /var/www/mod_pagespeed/files : File generate prefix for web sites. To configure PageSpeed you can either edit the package installed bundled pagespeed.conf (/etc/apache2/mods-available/pagspeed.conf, /etc/httpd/conf.d/pagespeed.conf) or insert configuration items inside Apache VirtualHosts config files or even if you need flexibility and you don't have straight access to Apache config files (on shared hosting servers where module is available) through .htaccess. Anyways try to avoid adding pagespeed directives to .htaccess as it will be too slow and inefficient. Configuration is managed by setting different so-called "Rewrite Levels". Default behavior is to use Level of "Corefilters. ", a set of filters (module behavior configs) which according to Google is safe for use. PageSpeed Filters is a set of actions applied to Web Delivered files. Complete documentation on Configuring PageSpeed Filters is here. I've also tested also pagespeed unstable release, but experienced some segmentation faults in both error.log and access.log so finally decided to keep using stable release. PageSpeed is a great way to boost your server sites performance, however it comes on certain costs as expect your server CPU Load to jump drastically, (in my case it jumped more than twice), there are Linux servers where enabling the module could totally stone the servers, so before implementing the module on a Production system environment, always first test thouroughfully with loaded pagespeed on UAT (testing) environment with AB or Siege (Apache Benchmarking Tools). 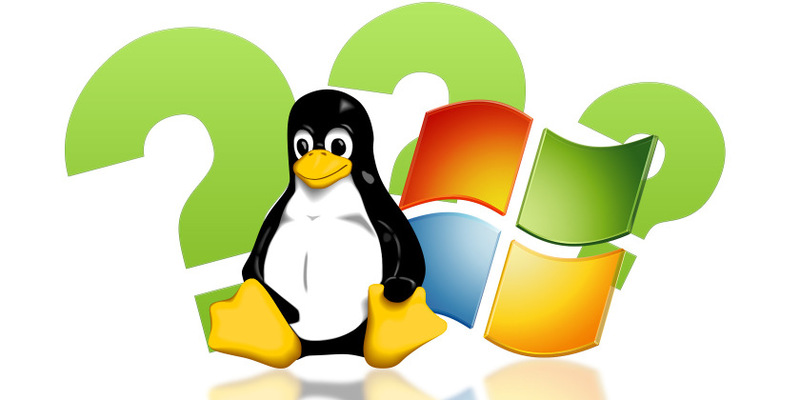 Part of our daily life as Web hosting system adminstrators is to constantly strive to better utilize our Linux / Windows hosting servers hardware. There are things to tune up for better server performance and better CPU / memory utilization on both server Application server side as well as the website programming code backend, html and pictures / images. Thus it is critically important to not only keep the Webserver / PHP engine optimized but keep hosted sites stored images and source code clean and efficient. We as admins usually couldn't directly interfere with clearning the source code and often we have to host a crappy written sites with picture upload forms with un-optimized Image files that was produced on old Photo Cameras, "Ancient" Mobile Mobiles, Win XP MS Paint, various versions Photoshop, Gimp etc.). It is a well known fact that a big part from a Website User Experience is how fast the user loads a page, thus if HTML / CSS loaded images loads slow has a negative impact on user look & feel about website. Therefore by optimizing the size of hosted sites Images, you Save Network bandwidth and in some cases when Large Gallery sites HDD disk space. optipng – PNG optimizer that recompresses image files to a smaller size, without losing any information. jpegoptim – lossless JPEG optimization (based on optimizing the Huffman tables) and "lossy" optimization based on setting a maximum quality factor. gifsicle – command-line tool for creating, editing, and getting information about GIF images and animations. 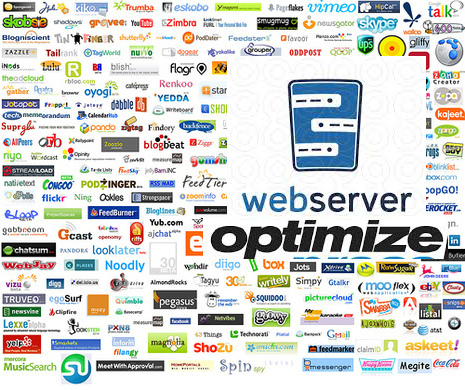 It is hence useful to first run manually availale Linux image optimization tools (to get an idea what they do) and later automate them to run as scripts to optimize server stored images size and make pictures load faster on websites and thus improve End Users Experience and speed up Image content delivery to GoogleBot / YahooBot / Bing Crawlers which will make Search Engines to position server hosted sites better (more SEO Friendly). How much percents of space (Mega / Gigabytes ) Pictures compress can save you? If you run it on 500MB image directory, you can probably save about 20 to 50MB of size, so don't expect extraordinary file reduce, however 5% to 10% reduce in size is not bad too. If you host 100 sites each with half gigas of data this would mean saving of 5GB of data and some 5GB from backups 🙂 At extraordinary cases you can expect 20% to 30% of storage reduce. For even better image compression you can try out GIMP's – Save for Web option. In jpegoptim command, the option –strip-all will strip any metadata including Exif data from images. For websites JPEG metadata is usually not needed, so usually its ok to strip them. Above jpegoptim example will decrease slightly JPEG image quality to 90%. quality level of 90 is still high enough and website visitors are unlikely to spot any visible quality reduction / defects in the image. Here is a basic optimize_images.sh which I used earlier before and was reducing the overall images size just 5 to 10%, then I found the much improved version of optimize images shell script (useful to clear up EXIF picture data / And Comments from JPG / PNG files). The script execution could take very long time on large image directories and thus could cause a high HDD disk I/O, however if ran once a week at night time its not such a big deal. Also if you need to further optimize million of tiny sized PNG files Yahoo Smush.it service could be helpful. For compression maniacs its worthy to check out also TinyPNG Service (however be awre that this service compresses files with significant quality loss) making picture quality visibly deteriorated. Besides optimizing server stored Pictures, here are some other stuff that helps in increasing server utilization / lower webpages loading time. Starting up with the installation (when site is to use Apache + PHP) for its backend, the first thing to on the freshlyinstalled Linux server is to implement the following list of Apache common Timeout variables that help better scale the webserver for the CMS-es hosted, enable Webserver caching with (mod_deflate), enable eAccelerator tune PHP common php variable etc. Other thing I sometimes use to speed-up performance of Apache child responce time up to 20-30 is to Include into Virtualhost / httpd.conf Apache configuration any htacces mod_rewrite rules. On too heavily loaded sites On-line stores / Large Company website portals with more than 60 000 – 100 000 unique IP visitors a day it is useful tip to disable completely Apache logging in access.log / error.log. This weekend I went with my wife for a Trip To Troyan monastery from Sofia – bus ticket currently costs 12 lv (6 euro) and the distance is rawly 160 km. Troyan is a remarkable mountain city situated in the center (heart) of Bulgaria, famous with being one of the main places where opposition and preparation for the Turkish Bulgarian war occured. Troyan monastery situated near Oreshaka village was one of the places where the idea of liberation of Bulgaria originated. Troyan was often visited by the remarkable revolutionaries and greatest Bulgarian heroes of all times like Vasil Levski and Hristo Botev. Here in Troyan there was existing one of the many secret commitees in period (1869 – 1876) – Central Secret Revolutionary Committee (BRCK – as widely known in Bulgaria), creation of this commitee become reality thanks to the Deacon Vasil Levsky who saw there is no awakened Bulgarians to fight for national freedom. Efforts of CSRC later lead to Liberation of Bulgarian from 500 years Bulgarians being under the yoke of Turkish Slavery. Our first impressions from Troyan were quite negative, the bus station looks post communistic and a little bit like a horror movie, near the bus station there was a lot of criminal looking gipsies. Just 5 minutes walk from there is a small beautiful park with children playground, what impressed me most in the park is a bush cutted in the form of ancient amphora and next to the park is the city center surrounded by a river Beli Osym, all from the city center you can see the beatiful mountains all around. There are two historical museums filled with archaelogical remains from early ages, national dresses, weapons from the Liberation war, explanation with chunks of history and Bulgarian national heroes connected to Troyan, there are beautiful expoisitions on how locals used to live through the ages museums, famous paintings original of local artists … Bulgaria is a unique country, because of it combines outstanding nature and rich history remains of which is well preserved and standing firm testifying about the Bulgaria glorious past. After taking a walk in the city center, we went to a local city bus station to take a bus to Oreshaka village – at the end of which is located Troyan Monastery. His Beuaitutide Patriarch Maxim who passed away 98 years old was born in Oreshaka village and become monk in Troyan monastery and was a brother of Troan monastery. Currently his holy body is buried in the monastery which is titled "The Dormition of the most Holy Theotokos". One can feel the place is graceful even from reaching near Oreshaka village, the near view is also stunningly beautiful. The bus from Troyan has a bus stop right in front of the monastery and is cheap (costed only 1.90 lv per person 0.80 euro cents). Bus to the monastery travels 4 times a day, so it was convenient to reach the monastery. Oreshaka and Troyan region is well famous since ancient times with its skillful craftsman and all kind of crafts developing. Near the monastery there is small chapel from which the monastery started, the history of Troyan monastery, all revives around the miraculous icon of Holy Theotokos (Troeruchica – The Tree Handed Virgin). The monastery story revives around this icon, a monk from holy Mount Athos was travelling to Vlashko (nowadays situated in Carpathians – Romania near border with Moldova), on his way he heard about a hermit with his pupil living near Oreshaka region and spend some time in fasting and prayer with the hermit local people heard about the miracle making icon and come from near and distant regions to venerate the Holy Virgin and pray. When the time come and he decided to move further in his trip to Vlashko he put the icon on his settled horse, made the sign of the cross and walked after few steps the horse stumbled and break his leg, in this event the monk understand it is not God's will to travel and he returned back to the hermit. After spending some time with the hermit, he settled again his horse but on exactly the same place the horse fall again – in that the monk understood this happens because the icon wants to stay on that place. The hermit offered to the monk that he stay there and they service God together, but traveling monk rejected, he venerated the holy icon for a last time and continued his travel to Vlashko. A small brotherhood formed by God's providence near the hermit and they decided to make a small wooden Church for Troeruchica and started servicing God there. This is how Troyan monastery started in the XVI century. The Glory of the Holy icon of Virgin Mary (Troeruchica) quickly spread all around enslaved Bulgarian lands and people come from all regions to pray to the Virgin to cure them, grant them good fortune, good health, solve spritual and family problems … The notes over the last 400 years shows that everyone that come with faith and prayed in front of the Virgin icon found confort, healing, numb started talking, deaf started hearing, paralytics walked. Monastery chronicles say that thanks to the Theotokos Troeruruchica in year 1837 the icon saved the locals from the black death which was taking its toll in the region, nobody that came to the monastery to ask for protection from the plague didn't suffered plague, everyone that decided to stay in the monastery during the plague survived, even though people from all around were coming to confess and take the sacraments, no one in the monastery wasn't infected by plague. On Sunday 10.08.2014 we were for the Holy Liturgy service and after that we walked through the monastic Church and saw near the Church the bell tower and next to it the old monks monastic graveyard. We visited also the museum of the monastery which contains various religious use objects dating back from year 1700+, old craftmen instruments, old icons, potirs, priest clothes, old coins from all around the world and Bulgaria. 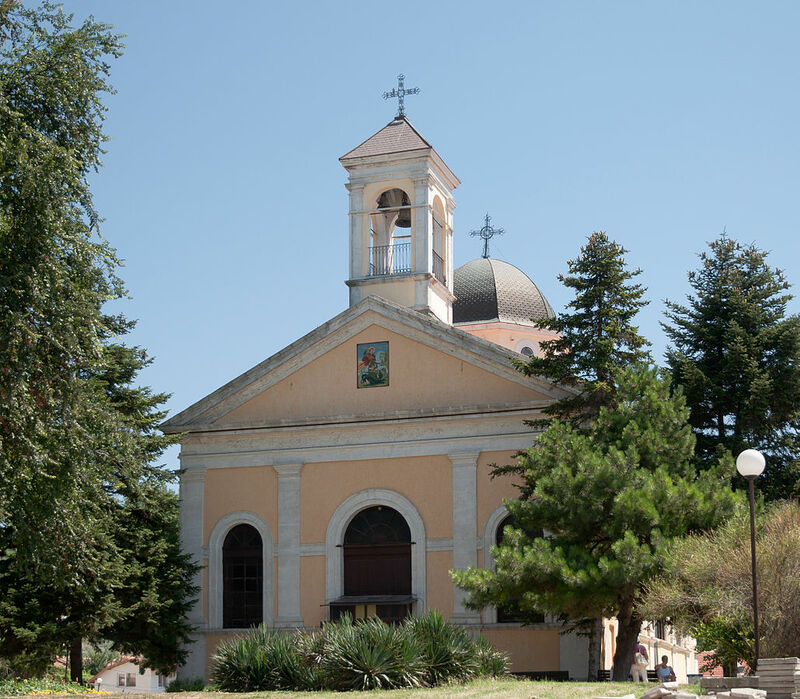 There was a lot of information about historical facts regarding the monastery brotherhood, as well as some chronicles and documents explaining participation of the monastery in the fight for national freedom of Bulgaria. The musem is made of two rooms one of which was the same room where the Apostle of Freedom Vasil Levsky – one can see there the exact hiding place which Vasil Levsky was using to sleep secretly – the hiding place looks like a normal wardrobe. After seeing the museum, we went to see the monastic Scyth – "Saint Nicola", which was used earlier by the monks, whenever they wanted to have period of seclusion to raise their spiritual life. 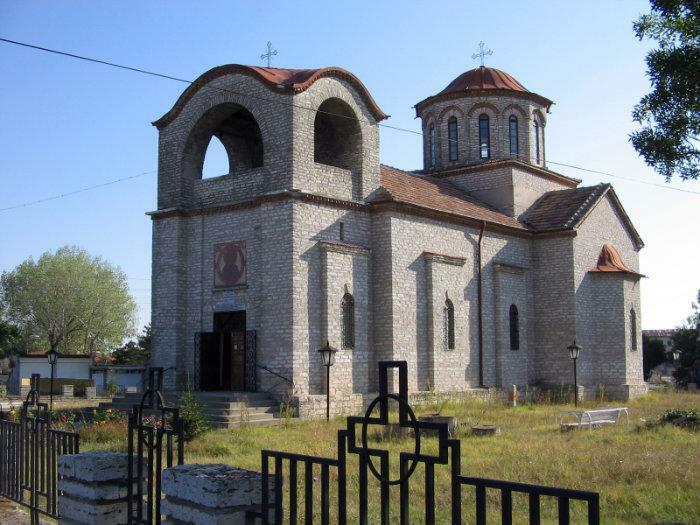 The Scyth has a large Church in honor of Saint Nicolas, most likely this Church was visited by people from the village, in times when Christians in Bulgaria was forbidden to attend Church services by Turkish Empire – and this is why it was build in such a secluded place. Near the scyth is the grave of a famous rebel for Bulgarian Freedom, and there is a cave with a spring. Then we walked back the road to Troan Monastery and near the monastery, we went to see workshop of a carpenter lady who makes wooden ornaments for Churches in the region and the monastery. The lady give us some herbs as a blessing. We had the chance to also take the blessing from the current Abbot Biship Sionij who was earlier rector of Sofia's Seminary Saint "John of Rila". 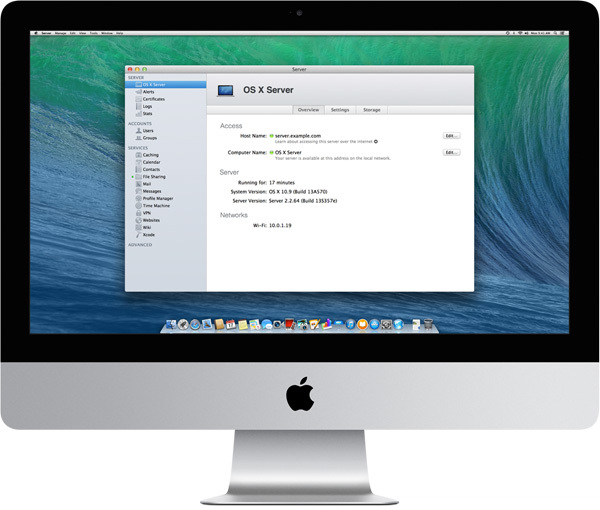 You might be stunned to find out Mac OS X has a server variant called Mac OS X server. For the usual admin having to administer a Mac OS X based server is something rarely to do, however it might happen some day, and besides that nowadays Mac OS X has about 10% percentage share of PC desktop and laptops used on the Internet (data collected from w3cschools log files). Thus cause it is among popular OSes, it very possible sooner or later as a sysadmin you will have to troubleshoot issues on at least Mac OS X notebook. Mac has plenty of instruments to debug OS issues as it is UNIX (BSD) based. Mac OS X has already a GUI tool called Activity Monitor (existing in Mac OS 10.3 onwards) in earlier verions, there was tool called Process Viewer and CPU Monitor. As a Linux guy, I like to use command line and there Mac OS X is equipped with a good arsenal of tools to check CPU load and Memory. Mac OS X comes with sar – (system activity reporter), top (process monitor) and vm_stat (virtual memory statistics) command – these ones are equivalent of Linux's sar (from sysstats package), top and Linux vmstat (report virtual memory statistics). That gathers 10 sets of metrics at 10 second intervals. You can then extract useful information from the output file (even while it's still running), this will get you cpu load on Mac OS system spitting stats every 10 seconds. PhysMem: 599M wired, 1735M active, 1712M inactive, 4046M used, 47M free. 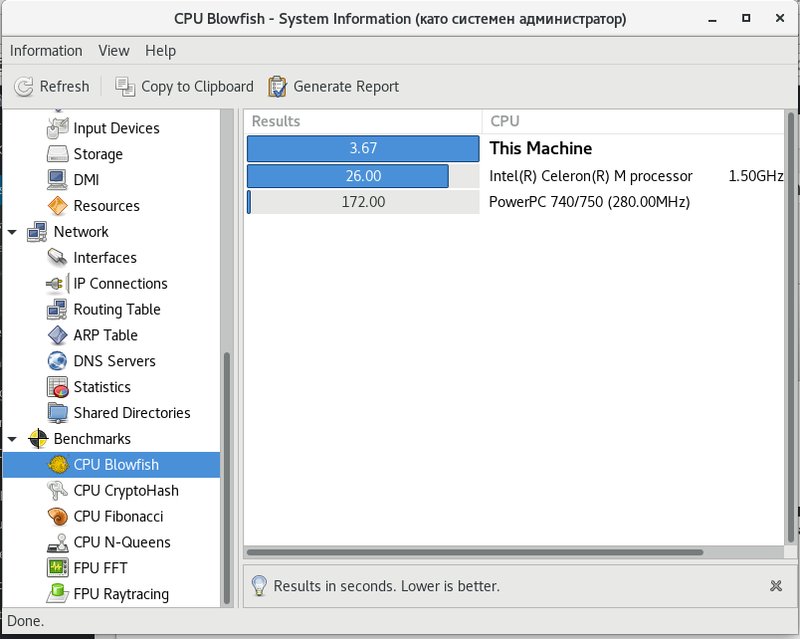 Kernel configured for up to 4 processors. 2 processors are physically available. 4 processors are logically available. But these five kings fled, and hid themselves in a cave at Makkedah.